Increase the storage in your workspace with the BBF Series A 24W Piler/Filer finished in White Spectrum for a versatile C-Leg table design that permits easy configurations. This stylish multi-storage component provides a combination of organizational techniques. This Piler/Filer provides two open storage areas along with two adjustable - removable shelves if you like to pile your work into compartments. In addition, this unit offers a locking lateral file with drawer glides on full-extension ball-bearing slides, which accommodates letter, legal or A4 files. This unit is constructed with 100% thermally fused laminate for durability and superior resistance to scratches and stains. 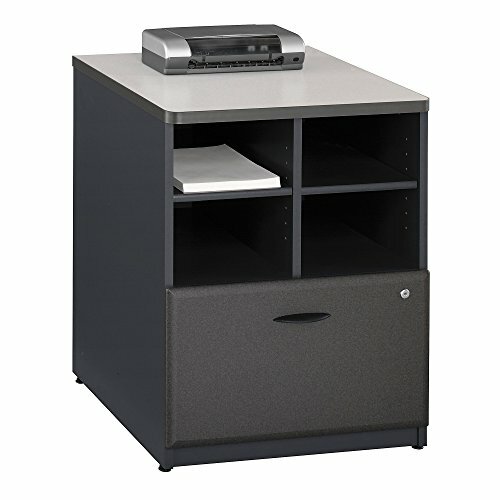 The Piler/Filer is desk height for side-by-side configurations, and works with the Series A 24W Hutch. Grommet in the back panel allows for wire access into the storage cabinet and offers adjustable leveling glides to correct uneven floor surfaces. Solid construction meets ANSI/BIFMA test standards in place at time of manufacture. The Series A Collection is backed by the BBF 10-Year Warranty. American made with U.S. and imported parts.